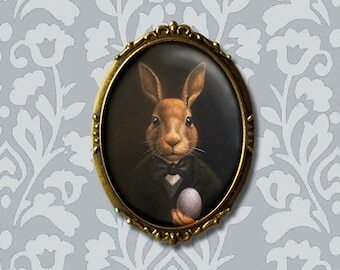 This Rabbit Portrait Print would make a charming addition to your animal portrait collection. 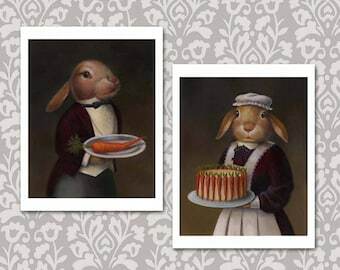 Mrs. Patmore of Downton Abbey has nothing on this Rabbit Cook. She is sure to liven up your kitchen decor and also makes a thoughtful gift for any cook, chef, gourmet or Downton Abbey fan! 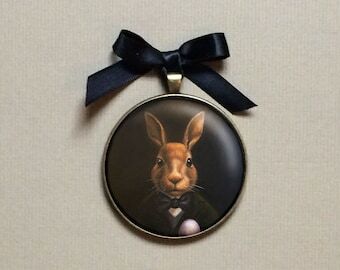 Her portrait, along with her companion the Rabbit Butler, are also available as brooches, ornaments, necklaces, cards, coasters and more. Some links are below. curiousportraits-at-lisazador.com for a link to my linesheets. ****16 x 20 are printed on luster finish paper that resists fingerprints and are borderless. They take 3-5 days to process since. They are shipped in a mailing tube. Copyright is non-transferable with purchase of print and buyer is not entitled to reproduction rights. 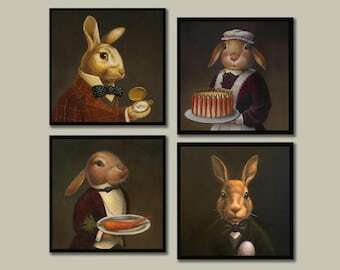 Love these rabbit portrait prints! Great quality print and very fast shipping. 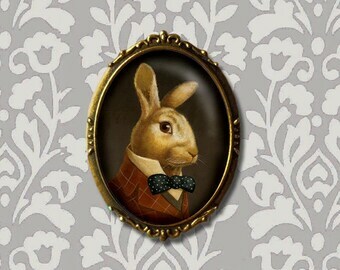 I purchased this beautiful rabbit picture for my sister. 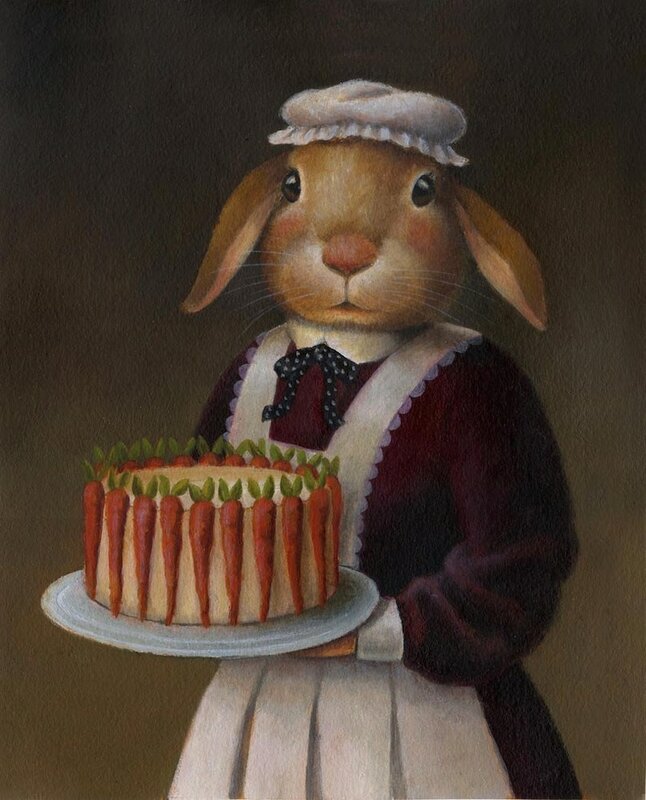 If Mrs. Patmore was a rabbit, this is what she would look like. 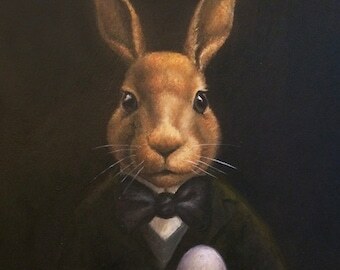 Received rabbits and Egg pictures in less than a week. Love it! Lisa was very fast on sending us the Portraits! Great quality and truly beautiful art work! 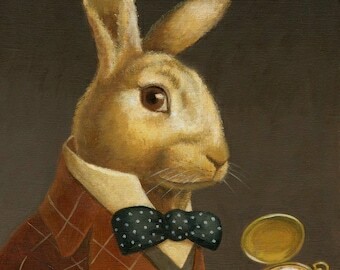 Wonderful art work. Very quick turn around. My daughters love everything coming from you. Payment at the time of the order is much appreciated! Orders unpaid after 48 hours will be cancelled and items returned to the shop. Please contact me if you need a special arrangement, I’d be happy to work with you. Please print your confirmation from Etsy as this will be your receipt. Customer service and satisfaction is very important to me. Please contact me if there is a problem with your order and I will do everything I can to resolve it. 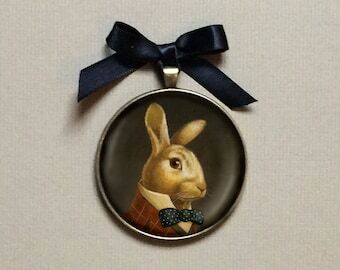 If you make a purchase from my shop I will be happy to leave feedback for you. If you are pleased with your item, I would appreciate your leaving feedback for me as well. Thank-you! Your prints will arrive in a cello sleeve sandwiched between 2 cardboard inserts for protection. I generally use USPS first class mail. If you need a package right away please select priority shipping. 11 x 14 prints are shipped rolled in a mailing tube for their protection. Please check the tracking link if your item does not arrive as expected and contact me if you have any questions. Mailing times vary and we are dependent upon the USPS. If you need an item in a short amount of time please select Priority mail at checkout. I will replace items that do not arrive within a reasonable amount of time and will do my very best to resolve any issues that arise! International orders please note that tracking is only valid until it leaves the U.S after which you will need to check with your local post office. Let me know if there is a problem, I am here to help! Custom portraits can be payed in installments, just contact me to set up scheduled payments for you. Item will only be shipped after payment is complete. 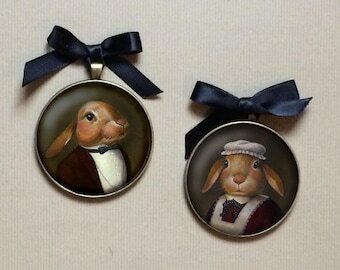 Custom orders are final sale.